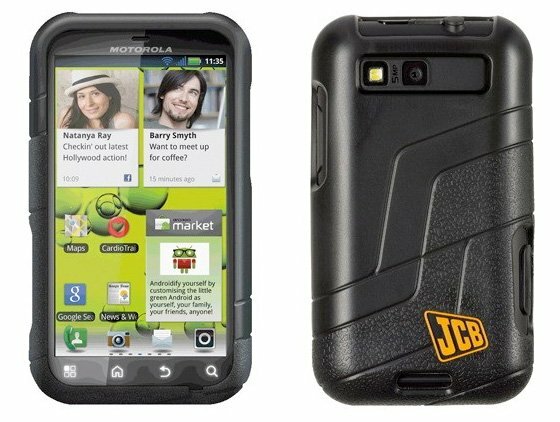 The href=”http://www.motorola.com/” rel=”homepage” target=”_blank” title=”Motorola”>Motorola DEFY+ JCB edition which we covered late last year is finally on sale now in the UK. If you’ve ever wanted to pick up a rugged, “life-proof” Android device that can stand the trials and tribulations of life at the construction site, this phone is for you. Just like the DEFY and DEFY+ before it, the DEFY+ JCB edition is waterproof, scratchproof and dustproof. However, it comes with an even more rugged body that enhances the shock resistance of the device. Other than the JCB branded body and preloaded apps such as a theodolite, spirit level, decibel meter and directions to local DIY stores. Other than that, specs feature a 1GHz processor, Android 2.3 Gingerbread, a 3.7″ Gorilla Glass display, href=”http://www.2gb.com.au/” rel=”homepage” target=”_blank” title=”2GB”>2GB of internal storage, a 2GB microSD card and a 5-megapixel camera. The phone can be yours for £260 in the UK.